Include hidden meaning in your logo. Companies rely on their logos for trying to get the message out about their services. However, some managers could really struggle with trying to showcase what exactly they do. There are ways to sneak your business model into the logo, and soon it could be everywhere from your entrance mats to business cards. According to CNN Style, companies have gotten creative with hidden meanings in their logos, like FedEx putting the arrow between the E and X, Toblerone hiding a bear in the mountain of the logo and electric company ED using negative space to have their logo look like a plug. However, as the news provider points out, sometimes the hidden meaning in a logo is completely by accident. The consulting firm that manages FedEx explained to the news provider that the arrow was an accident, but it ended up working really well. Not only is this a clever way to add to a logo, it can also help create brand loyalty. CNBC reports that brands use hidden meanings in logos as a way to unconsciously convey emotional responses when seeing these designs. This can help bring brand loyalty to the forefront, and potential customers may find a sense of comfort from these brands, keeping them as customers for life. What kind of tone are you setting in your office? You’ve decided to get your business off the ground. Great. Now you just need a space for it. 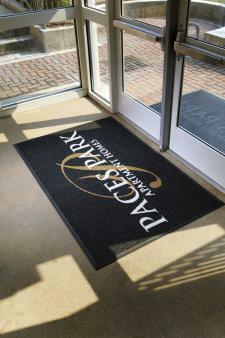 Roll out the logo mat and welcome potential new customers and teammates to your new venture. You need to make sure your space is inviting, but you also have to strategize the kind of overall vibe you’d like the workspace to have. Entrepreneur reports that you need to be strategic about the kind of space you set up for your startup. You should want employees to feel as though they can collaborate with each other and make guests feel welcomed upon entering. The news source suggests having a large reception area, which can also double as a lounge area. This way, employees feel like they can take a break in between working hard. Forbes is quick to point out that the kind of space you set up may depend on the building. Older structures typically have restrictive offices and tighter quarters, while newer designs lend themselves well for big open spaces, reception areas and meeting rooms. It all depends on the kind of tone you’re trying to set. So be mindful when you’re looking at real estate for your business venture. Trying to make the right impression with your office lobby? Little details matter. Think about adding logo mats to the entrance as a way to greet guests and also provide a sense of personal detail. An office space can easily become stale and seem just like every other business, so it’s important that you add things that bring out your brand’s personality to anyone who enters. Newsday reports that you want to add personality to the lobby as a way to freshen up the space and also showcase your brand. Think about not only having your logo everywhere, but also spend some time thinking about your brands colors and how you can incorporate them into your lobby. Elle and Company reports that you need to come up with a distinct color palette for your brand. This can be helpful when you’re trying to do things like decorate your office lobby and try to add a little bit of personality to your brand. If you’re on the fence about what colors to go with, take a look at your logo and branch out from there. There are plenty of available resources that detail what moods certain colors evoke, so you can expect how your customers will feel while they’re visiting your business. Logo design is a critical part of building any brand. While creative firms may try and sell a company on the latest and greatest trends in building a brand, there are some basics that withstand the test of time. 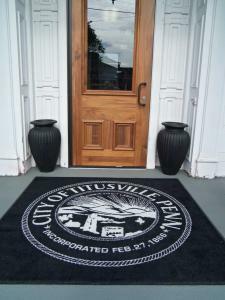 You’re going to have logos on your entrance mat for years to come, so you need to make sure the end result is something you’re happy with. Entrepreneur reports you need to think about the old school branding techniques in order to be effective, such as creating business cards. These are a physical reminder for potential customers, employees and partners. The same goes for printing physical coupons to mail, as these serve as a reminder to customers whenever they’re sifting through their letters and bills. According to Forbes, a brand should always try to set specific goals for what they want to accomplish from a marketing perspective. Whether it’s building a number of followers or closing an amount of sales, everything can be measured. If you’re trying to increase brand recognition, you have to make sure you have a memorable logo that can be found throughout your business and your materials. This can help keep your company at the front of people’s minds.